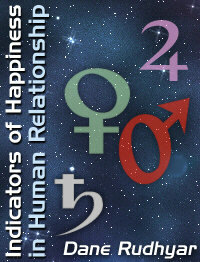 The area of human relationship has always been one of the most fascinating application of astrology. In this classic article Rudhyar explores how the planetary pairs of the Sun-Moon, Venus-Mars, and Jupiter-Saturn offers insights into the dynamics of a relationship. "Will I find happiness with this person?" is one of the questions most often asked of a student of astrology. The concrete problem may refer more precisely to marriage or to any other kind of personal relationship; but, in any case, the issue deals basically with the longing for happiness which every human being harbors in his or her heart. We know instinctively that this longing can be satisfied only by some kind of relationship. However, there can be many types of relationship; and the desire for relationship — and for happiness — can operate at several levels. He who succeeds in fulfilling his desire normally reaches happiness in this fulfillment; yet in many cases, one finds within one's nature conflicting desires. As we seeks happiness or personal fulfillment, we may be pulled in several directions, often in two opposite directions; and after one desire is satisfied, we may find a peculiar sense of emptiness and frustration in our heart because in the process of fulfillment, other, perhaps equally strong, desires have been blighted or crushed.